The world of samsara is full of conflict: nations battering nations, families divided, lovers betraying lovers, drivers swearing at other drivers, even the various parts of our own personality challenging each other for dominance. To heal ourselves and find a better harmony with each other in this world we need better tools, skillful means, a clear path of reconciliation. This issue of Inquiring Mind is dedicated to finding and smoothing that path. A child of divorce raised in two homes, each with its particular clashes, I developed my own penchant for arguments with relatives, friends and workmates. And I’ve been drawn to the antidotes—childhood marches for “banning the bomb” and civil rights, movements for peace and reconciliation. So I took up my work on this issue of the journal with particular interest. Habits of blame and retribution can be deeply entrenched. As the Buddha extols in the Dhammapada, “Greater in combat than a person who conquers a thousand times a thousand people is the person who conquers herself.” Indeed. To vanquish those armies of habits insidiously running our lives, the writers and interviewees featured in this issue urge us to tap into forces of great magnitude—the power of our Buddhanature, and of Nature itself. The work of peacemaker Marshall Rosenberg is grounded in the universal capacity to access a fundamentally compassionate nature. Sounds like Buddhanature to me, although Rosenberg doesn’t describe himself as a Buddhist. He’s trained many practitioners and several Buddhist teachers, and traveled to scenes of conflict all over the world bringing this message. He shows even the most entrenched “enemies” that if they stay connected to themselves and hear each other’s unmet needs, then they will find that they enjoy contributing to each other’s well-being. The work of land conservationist Peter Forbes is founded on an analogous assumption of the universal power of land, of Nature, to heal and bring reconciliation to the culture. In one example, Forbes talks about how the return of the Nez Perce people to their ancestral lands fostered reconciliation between the Nez Perce, the white descendants of those who drove their tribe from the land, and the salmon in the local rivers. 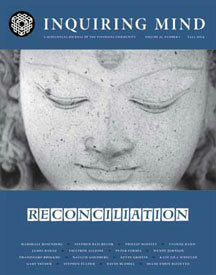 Vipassana teacher Phillip Moffitt has developed a potent “Reconciliation Meditation.” He introduces a series of articles in which Zen teacher Yvonne Rand, vipassana teacher James Baraz, and Tibetan Buddhist teacher Tsultrim Allione tell stories of family reconciliation from their own lives and those of their students. Each offers a practice, from lovingkindness to Chöd. To further the exploration, we include an interview with poet David Budbill, whose poems grace our Poetry pages. Fiction writer Kate Wheeler, insight meditation teacher and Middle East peace activist Stephen Fulder, and Theravada monk Thanissaro Bhikkhu also offer reflections on the theme. Sun-faced Buddha, moon-faced Buddha. Let’s tap into that when conflicts rage and see what happens. Photographer Dana Anjali (previously Dana White) is a community dharma leader at Regina Insight Meditation Community in Saskatchewan, Canada. She also teaches workshops on Healing Through Meditation.